Does the DVD play with audio when you play it on your PC? Does the audio play anywhere? Your answers lack detail but seem to point to the file and that you did not Author a DVD Movie. Authoring: ONLY MyDVD and Video Copy and Convert can Author a Movie! 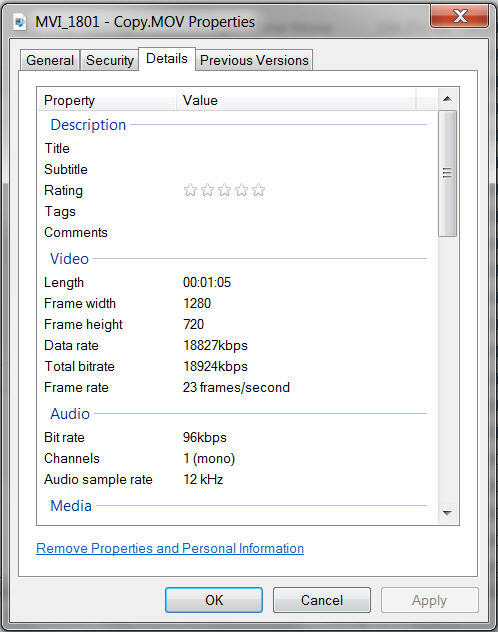 All the rest, Burn Data Disc and Edit Videos Simply (Fast Flick) only create a video file that is not playable in many Players. Keep those in mind, but here is a possible fix. Run your captured file through a converter before you use it! (we are testing the file this way for conformity to Industry Standards) Players are not a good test as they are designed to accept many flaws. Also I did ask you 4 questions and you answered only one and the answer was not really specific to the last question in the bunch... The other three were important to diagnosing this, but you left us with no real path forward. You mentioned age in your other Topic, with a few exceptions, most of us are retired and on pension or disability so "age" is something unique. 1. Right click on your captured video and click properties. 2. Do a screen capture of the General and Details tab like the examples below and attach them in your post. 3. It would be helpful if you posted a short clip on a download site and post a link here so we can poke the file with a stick. I use a free program called "Jing" by TechSmith https://www.techsmith.com/jing.html. Following this thread, one sees that there is no hope for the OP. He has said that technology is not his friend but he is persistent and trying!